Members of the IAMAW Spanish Leadership Working Group (SLWG) convened last week at the William W. Winpisinger Education and Technology Center (W3) for their annual meeting to discuss the direction of the group, improve their visibility, and to review and update the Spanish education materials. One fascinating idea that arose from the week was creating the first All-Spanish Facebook Live that will take place on Friday, March 16. Other issues discussed include a more visible footprint throughout the IAM by way of better communication with districts, use of social media, expansion of the SLWG, formation of a LatinX network that will specialize in issues concerning IAM Latino members, and IAM iMail visibility. There is an urgent need to educate our members in their native language to inspire activism; members are more likely to get involved when they see that their union’s issues align with their own concerns. The Spanish programs at W3 are an excellent way of training and inspiring our next generation of IAM leaders as the labor movement develops and the demographics of our country continue to change. The SLWG members, who hail from every territory in the IAM, are a diverse mix of Spanish speakers who come from various countries throughout Latin America. 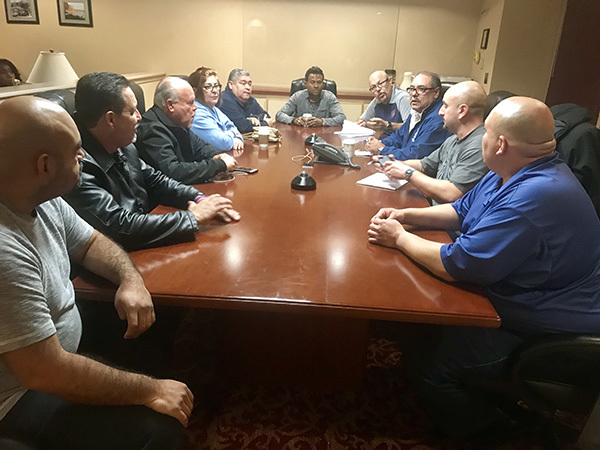 Members of the group, led by IAM Grand Lodge Representative Macario Camorlinga, consist of, Eastern Territory Chief of Staff Juan Negron, Local 2725 Business Representative Jose “Lole” Rodriguez-Baez, IAM Grand Lodge Representative Geny Ulloa, Local 2339N Shop Steward Monica Pasillas, Local 914 Shop Steward and Legislative Director Ines Garcia-Keim, Local 1759 Shop Steward Adriana Picasso, Local 701 Shop Steward Danny Arreola, Local 701 Recording Secretary George Mejia, Local 2152 Shop Steward Angel Perez, as well as W3 Education representatives Edmundo Osorio and Jorge Bonilla. SLWG members unable to attend include retired Western Territory Grand Lodge Representative Joel Ochoa, IAM Western Territory Grand Lodge Representative Richard Suarez, IAM Southern Territory Grand Lodge Representative Javier Almazan, IAM District 725 Organizer Calixto Tapia, Local 2198 President Norma Ramirez and Anne Wiberg from the Midwest Territory. The first class, Spanish Leadership I, will take place March 11–16, 2018. However there are several other Spanish programs that target the various levels of union leadership education. There are also staff classes including Collective Bargaining and Organizing I, both offered in Spanish. Please note that enrollments in any of the Spanish Leadership programs do not count against your lodge’s regular leadership school allotments.